This navy blue jacket by Lanvin has vertical pinstripes in red, offwhite, and curry. 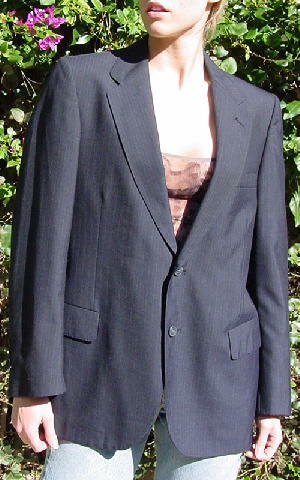 It has long lapels and a two button front. 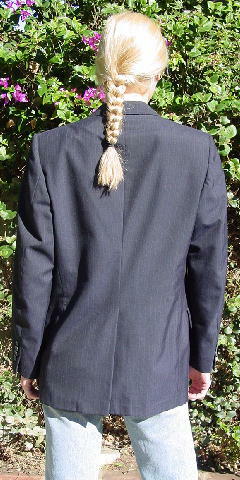 The long sleeves have 4 buttons on each, and there are three pockets in the front - one breast and 2 lower flap pockets. 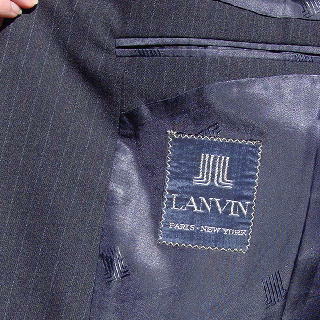 It has a nice navy blue lining with the Lanvin logo all over with 3 interior pockets. The back has a 10" fold-over flap. It belonged to a larger size female model. shoulder to end of sleeve 24 3/8"
shoulder to hem 28 1/4"